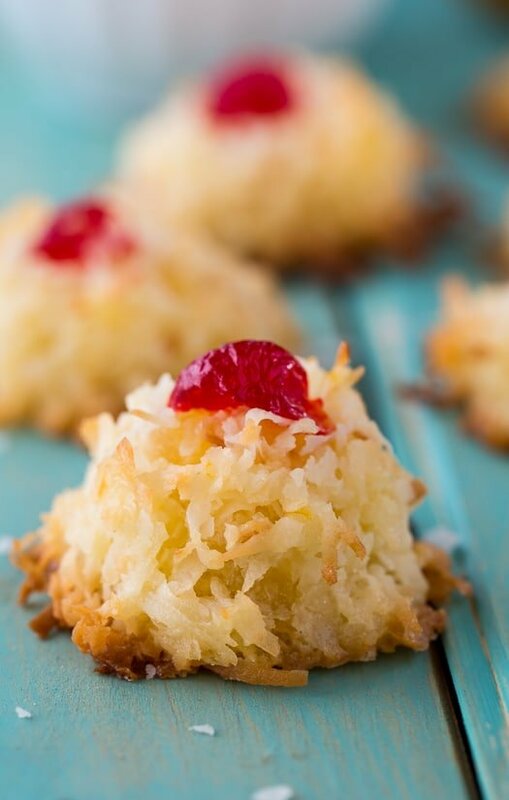 Ambrosia Macaroons have a delightful citrus flavor and are just the thing to add to your cookie platter this holiday season. They are chewy with lots of coconut and a little flavor form some orange zest and finely diced dried pineapple. 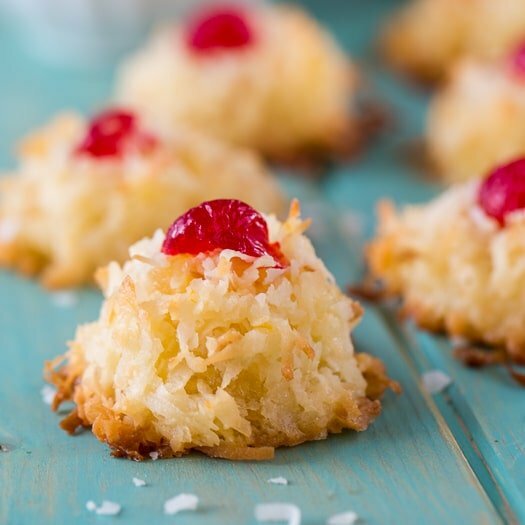 A piece of maraschino cherry on top gives them a super festive look. 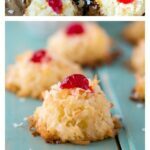 But I am a macaroon lover and a chewy coconut based cookie this time of year gets me excited about those Samoa cookies that will be making their rounds in just a few short months. Ambrosia, if you’re not familiar with it, is a type of fruit salad with coconut and usually pineapple, oranges, and marshmallows, and a sweet creamy dressing. I personally think ambrosia is much better in cookie form. You can drizzle a little melted chocolate on them to gussy them up some. 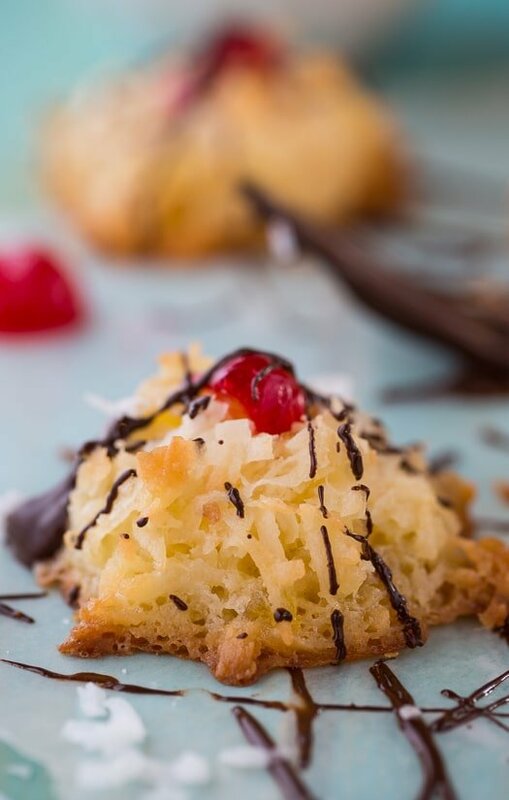 If you are a fan of macaroons you will adore this southern version of them. Place rack in center of oven and heat oven to 325 degrees. Line 2 baking sheets with parchment paper. Beat butter with an electric mixer until smooth. Add salt, orange zest, and vanilla extract. Using a rubber spatula, mix in coconut and dried pineapple. Drop batter by tablespoonfuls onto prepared sheets. Press a cherry half onto the top of each mound. Bake one sheet at a time, for about 25 minutes or until lightly browned around edges. If desired, melt chocolate and use a fork to drizzle it on the macaroons. 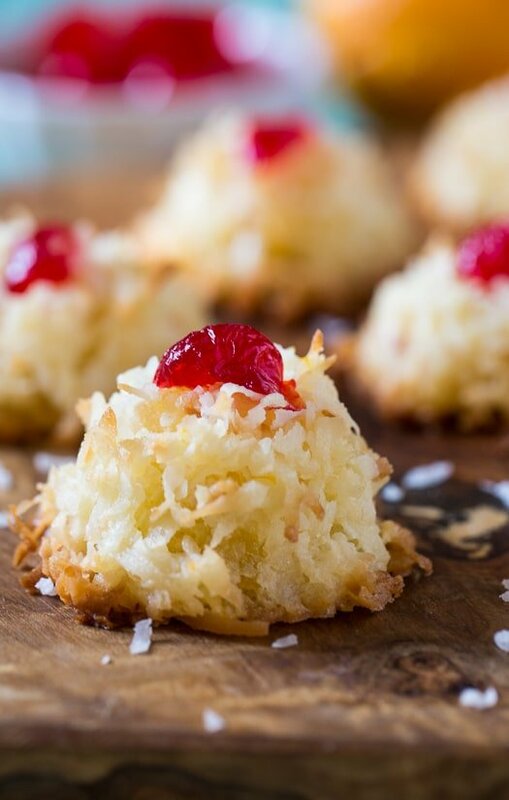 This entry was posted in Cookies, Desserts and tagged ambrosia, coconut, macaroons. Bookmark the permalink. Aw how sweet are these!? Just gorgeous! Perfect for a Christmas treat. I love the flavor of these macaroons, Christin! Such a fun twist on a pretty treat. Sounds like the perfect dessert! I absolutely adore homemade macaroons! I love how bright and cheerful these look with the cherries on top—totally puts me in a happy mood. 😀 Pinning! Christin, I have only seen ambrosia on TV and I have to be honest, I’m not sure I’d be able to dig in…but I would have zero problems diving into your macaroons! They sound yummy and look so festive for the holidays! Love it. Yum, your photos are making me crave some macaroons. I love the the ambrosia twist. Clever! Love you macaroons.. I keep saying I need to try them out.. but I always turn on doing macarons. Your macaroons are really awesome. These macaroons are just so darn lovely. Had to pin them. Great flavor! I love macaroons! For some reason I’ve only made my own once, but this recipe looks so good so I think I will have to make them again! These macaroons look so pretty and I love the twist from the traditional ones…thanks for the recipe Christin!